If you like cheesecake, this will be the cake for you. 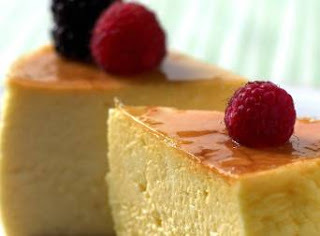 It tastes just like the famous Hilton Hotel's cheesecake, but it is not as sweet and it is lighter but very yummy. It uses 2 blocks of cream cheese instead of the usual four. I made an 8 inch cheesecake for my staff and everyone wants the recipe so here it is, try it. 4. Put mixed biscuits onto the cake pan and press it flat with a spoon. 3. Add sour cream and whipping cream to the mixture and continue to beat till smooth.